I was immediately taken by her stand at the sixth annual Puces de l'Illu last fall. She was displaying an illustration of a redheaded girl in a green face mask. I admired it longingly. Little did I know that my friend had already purchased the print for my Christmas gift. I felt so lucky! Agathe Singer is a highly versatile illustrator based in Paris, who grew up in Bretagne (on the West coast of France) in a very small village by the sea. She creates illustrations for a wide range of projects from fashion to music to perfume and home decor. 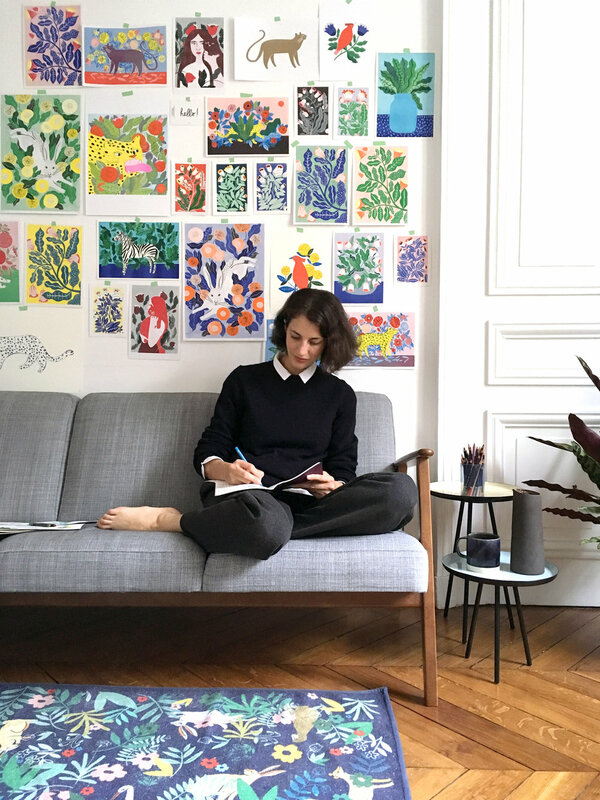 It’s no surprise that Agathe is able to break down the flowers and hidden animals in such an adeptly playful manner in her own children’s book. Her enchanting children’s book, Les couleurs de mon jardin, was published by Maison Eliza as part of their “Menthe à l’eau” collection. The biggest challenge of working as a freelancer, the thirty three year old tells me, has been managing her workload while managing her personal life and space. “Over the past years, I’ve been working a lot, developing my portfolio and taking on as many projects as I could. I’m trying now to prioritize and take time for myself and my family.” Above all, she does not want to forget to enjoy herself. “It really gets me down if I'm painting without fun,” she says. AS: I work everyday to be less affected by it. I try to free myself from capitalism by doing work I chose and love, by supporting other artists and independent designers, by working on reducing my carbon footprint/impact on the earth. RS: Who are your favourite independent designers? AS: La Jupe du Succès, Bazarine (jewels) and Slash Brand. RS: What do you find artificial or deceiving in our world? AS: I think plastic is for me the most artificial and deceiving thing in our world. We managed to create an absurd chain of petrol extraction, exploitation, modification and industrialization... an incredible amount of work and pollution for totally useless products. The plastic stirrer, for example, is the worst thing ever created. We don't need it, we use it once, and then it takes up to 400 years to disappear - if it doesn't end in a fish or a bird. AS: I think my work is growing more political in the last month and a bit less decorative. I'm very influenced by the power of young feminist and climate activists on Instagram and other social media. I think they are terrific platforms to share ideas and advocate for change and I hope I'll be able to contribute with my art. AS: I think young artists need support from their community. At a younger age I wish I would have turned to more experienced artists for advice and help, mostly regarding the contracts/fees part of the job. I find that young designers are more likely to be underpaid or working for free under the promise of exposure, which is never good. I think it takes away a lot of time from working on personal projects, which can help you grow way faster. Check out Agathe’s prints for sale!